I had the opportunity to try out Doterra essential oils recently. I received a kit called Introduction To Essential Oils. It contained Lavender, Peppermint and Lemon. I am familiar with essential oils and these particular oils I would consider staples. I never used DoTerra before and I found these oils to be high quality. Lavender has many uses. I have always used it to help my kids get to sleep at night. It’s also used as a natural antibacterial. My daughter scraped her knee last week so I put a few drops on her knee every day. It healed up nicely. I didn’t use anything else except the lavender oil. You can also use it on bug bites and burns. There are so many other uses. Lavender should be a staple in everyones home. Lemon is an oil that also has a lot of uses. It can be used to clean with. You can also diffuse it in a room to get rid of bad smells without adding any chemicals into the air. I also put a few drops in a glass of water in the morning and drink it. It tastes good and the smell is so nice. It’s a natural liver detox and I think it helps with water retention. If you make your own cleaners lemon added to your cleaner can save you a lot of money and clean well. It’s a natural germ killer and good for removing grease. Your not adding any chemicals and it smells nice. See natural cleaner recipe below. Peppermint Peppermint is a great pick me up. You can add it to water for indigestion and any stomach upset. It can be diffused in the air for a nice smell and air purifier. Its a good oil to diffuse while your kids are doing their homework. Its stimulating and it creates awareness. I used peppermint on a cruise to ward off sea sickness. I only used peppermint and while others used the wrist bands and pills I was the only one we knew on the ship that didn’t get sick. I just rubbed it on my skin around my neck so I can breath it in. You can add it to water and drink it also to help with headaches. 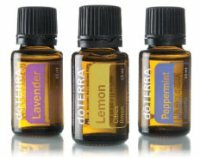 Doterra oils are completely natural and have no fillers or chemicals added to them. They are different than oils you get at the health food store because they don’t have any chemicals added, they are completely 100% pure. If your going to start using oils in the home I would suggest starting out with these 3 oils because of the amount of uses for these oils. Mix together to use for cleaning. Its a food, child and pet safe cleaner that will disinfect and refresh the area.